John Lawrence Sullivan in his prime. John Lawrence Sullivan (October 15, 1858 – February 2, 1918) is widely recognized as boxing's first modern world heavyweight champion and the last of the great bare-knuckle fighters. He was a hugely popular figure in the late-nineteenth century. Sullivan's boxing skills remain well known even today, more than a century after his last fight. Sullivan fought famous bare-knuckle boxer Jake Kilrain in 1889 in a match considered a turning point in boxing history. It was the final world-title bout fought under the London Prize Ring rules, and therefore the last bare-knuckle heavyweight title bout. Sullivan won the fight after the seventy-fifth round of the grueling 80-round match. In 1892, Sullivan faced "Gentleman" Jim Corbett in New Orleans wearing gloves under the Queensberry Rules, with the fighters wearing five-ounce gloves. Sullivan's rugged boxing style was no match for Corbett's refined skills; he was knocked out in the twenty-first round. Known for his hard drinking and carousing, Sullivan swore off alcohol in his retirement and became a temperance lecturer. Having already spent most of his $1 million in ring earnings, he retired to a Massachusetts farm. At age 59, he died from the effects of his years of alcohol abuse. Sullivan’s vast renown and charismatic style did much to advance the sport of boxing in America. He was the first true American sports idol and is still considered by some to be among the all-time best heavyweights. Sullivan was born in Roxbury, Massachusetts (now a part of Boston) to Irish emigrant parents, Michael Sullivan from Abbeydorney, County Kerry and the former Catherine Kelly from Athlone, County Westmeath. Nicknamed "The Boston Strongboy," Sullivan apparently inherited his solid physique—he was five feet, ten inches tall and weighed 190 pounds—from his mother, who equaled her grown son’s stature. Sullivan’s father, although an aggressive scrapper himself, was barely five feet, three inches tall. 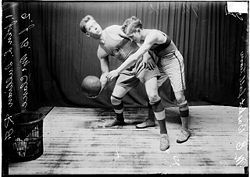 The young John L. Sullivan (with ball) as a basketball player for the First Methodist Episcopal Church in Chicago. In his youth, Sullivan was arrested several times for boxing where the sport was forbidden. As a teenager, he would fight in Boston barrooms, issuing a challenge that he “could lick any man in the house.” In 1879, he challenged anyone in America to fight him for $500. Sullivan also engaged in weightlifting exhibitions, hefting, and sometimes throwing kegs of beer. He became more serious about fighting when at the age of 18, he engaged in three-round and four-round amateur bouts. Sullivan briefly attended Boston College since his mother wanted him to become a priest. He then worked at various odd jobs, until his try at plumbing reportedly ended when he broke his employer’s jaw in a dispute about the proper pipe to use. A capable athlete, Sullivan played semi-pro baseball in the Boston area, and the Cincinnati Red Stockings offered him a contract, which he declined. Sullivan’s big break came when he went to the Dudley Street Opera House in Boston in 1877. One of the acts featured heavyweight boxer Tom Scannel, who skipped rope, shadowboxed, and sparred with partners chosen from the audience. Often, the sparring partner was in on the act and would box two furious rounds before succumbing in the third. This night, Sullivan, urged on by the crowd, climbed the stage to face Scannel, who reportedly offered to shake hands, but suddenly slugged Sullivan instead. In return, Sullivan blasted Scannel with a half-dozen rapid blows and knocked him into the orchestra pit. The scene at the opera house launched young Sullivan on his professional career. In 1878, he knocked out Cockey Woods in Boston. In 1880, he boxed exhibitions with noted scientific boxer Professor Mike Donovan and former champion Joe Goss. Sullivan outclassed them both. The next year he scored an eight-round knockout over John Flood, known as the Bull’s Head Terror. Fighting on a barge in the Hudson River to evade the authorities, Sullivan made short work of Flood, knocking him down eight times. Both fighters wore tight, unpadded gloves. On February 7, 1882, Sullivan met Paddy Ryan, the heavyweight champion—at least in American eyes—in Mississippi City, Mississippi. It was a bare-knuckle contest, and basically one-sided. Sullivan dominated the fight and knocked Ryan out in the eighth round with a right to the jaw. Sullivan was now considered the world champion, although there was some disagreement among British and Australian followers of the sport, since in Sullivan's era no formal boxing titles existed. For the next two years, Sullivan went on a coast-to-coast tour by train with five other boxers, challenging anyone to stay in the ring with him for four rounds for a $1,000 prize. The tour was scheduled to comprise 195 performances in 136 different cities and towns over 238 days. He took on all comers. Only Joe "Tug" Wilson, an English fighter, went the four-round distance, although Wilson reportedly went to the floor 24 times during the bout to avoid being knocked out. In 1883, Sullivan faced British Empire champion, Charlie Mitchell, in a gloved bout. Although Sullivan was winning the fight when the police stepped in to prevent the battered Mitchell from absorbing more punishment, Mitchell had shocked Sullivan and his fans by knocking him down in the first round. Their second meeting took place in 1888 on at the estate of Baron Rothschild at Chantilly, France in driving rain. It went on for more than two hours, at the end of which both men were unrecognizable and had suffered much loss of blood; neither could lift his arms to punch and the contest was considered a draw at 39 rounds. Depending on the modern authority, Sullivan was first considered world-heavyweight champion either in 1888 when he fought Charley Mitchell in France, or the following year when he knocked out Jake Kilrain in round 75 of a scheduled 80-round bout. However, at the time, neither match was considered to be about determining a world heavyweight champion. A champion's belt had been presented earlier to Sullivan in Boston on August 8, 1887, inscribed: Presented to the Champion of Champions, John L. Sullivan, by the Citizens of the United States. Its centerpiece featured the flags of the United States, Ireland, and the United Kingdom. The Sullivan-Kilrain fight went 75 rounds before Kilrain's corner conceded the match. The Kilrain fight is considered to be a turning point in boxing history because it was the last world title bout fought under the London Prize Ring rules and therefore the last bare-knuckle heavyweight title bout. For the first time, newspapers carried extensive pre-fight coverage, reporting on the fighters' training and speculating on where the bout would take place. The center of activity was New Orleans, but the governor of Louisiana had forbidden the fight in that state. Sullivan had trained for months in Belfast, New York under trainer William Muldoon, who reportedly struggled both to keep Sullivan away from liquor and to help him reduce his weight, which had ballooned to 240 pounds. Sullivan went into extensive training with champion wrestler William Muldoon to trim down to 205. On July 7, 1889, an estimated 3000 spectators boarded special trains for the secret location, which turned out to be Richburg, a town just south of Hattiesburg. The fight began at 10:30 the following morning, and it looked as if Sullivan was going to lose, especially after he vomited during the forty-fourth round. But the champion got his second wind after that, and Kilrain's manager finally threw in the towel after the seventy-fifth round of the 80-round match. For three years after the Kilrain match, Sullivan did not fight. Instead he toured as the hero of a self-promoting play called Honest Hearts and Willing Hands. However, he continued to carouse and box in exhibitions, memorably one against "Gentleman" Jim Corbett, with both fighters sparring in formal evening attire. During this period he became physically unfit. He finally agreed to defend his title in 1892 against Corbett. 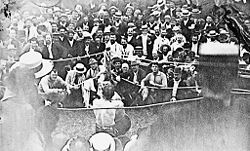 The heavyweight contest occurred under the Marquess of Queensberry rules, but it was neither the first title fight under those rules, nor was it the first title fight using boxing gloves. The contrast of styles was obvious, matching Sullivan's power and ruggedness against Corbett's refined boxing skills. Out of condition due to his overly indulgent lifestyle, Sullivan was no match for Corbett, who stayed clear of the champion for 12 rounds. By the seventeenth, Corbett's tactics were wearing Sullivan down, resulting in his being knocked out in the twenty-first round. Since no champion after him fought bare-knuckled, Sullivan is considered the last bare-knuckle champion. However, Sullivan had fought with gloves under the Marquess of Queensberry rules as early as 1880 and he only fought bare-knuckle three times in his professional career (Ryan 1882, Mitchell 1888, and Kilrain 1889). His bare-knuckle image came about largely due to his infrequent fights from 1888 up to the Corbett fight in 1892 which had been bare-knuckle. The aging Sullivan in 1904. Sullivan retired, but appeared in several exhibitions over the next 12 years, including a three-rounder against Tom Sharkey and a final two-rounder against Jim McCormick in 1905. He continued his various careers outside boxing such as stage actor, speaker, celebrity, baseball umpire, sports reporter, and bar owner. He did some acting and, surprisingly, swore off alcohol. Previously known for his prodigious drinking, Sullivan became a temperance lecturer. He retired to a Massachusetts farm, having depleted most of the $1 million he had earned in his public career. In his later years Sullivan remained a teetotaler and often supported the temperance movement. However, he died of health problems caused by his earlier alcoholism at age 59 and is buried in the Old Calvary Cemetery in Mattapan, now a neighborhood of Boston. Sullivan’s vast renown and charismatic style did much to advance the sport of boxing in America. Sullivan has become a boxing immortal, the link between bare-knuckles and glove fighting. He was also the first great American sports idol. He is still considered by many commentators to be among the best heavyweights ever. Sullivan was elected to the International Boxing Hall of Fame in 1990, as a member of the hall's original class. Sullivan's professional record is estimated at 35 wins, one loss, and two draws, with 30 wins by knockout. However, he fought many exhibition matches, and the sources disagree on his exact record. 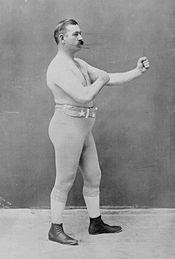 History of "John L. Sullivan"